Both types of spam may raise your blood pressure, only one due to high sodium content. Someone tried to email me, and their message was bounced back to them. We’re sorry. If you’re here, you were unable to receive legitimate email due to a filter that was designed to block spam (unsolicited commercial email). 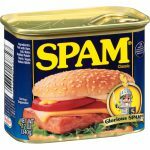 Bway.net participates in a voluntary anti-spam effort that involves a mail filter. Any email coming from mail servers that are known to be compromised/infected or have a record of sending large amounts of unsolicited email is rejected by Bway’s incoming mail server and returned to the sender as undeliverable. As soon as the system administrator responsible for the mail server in question (i.e. the system administrator of the sender’s internet service provider) fixes the open relay, abuse or security issue, they should contact the organization that blacklisted it (addresses below). The mail server will then be removed from the list (in most cases immediately), and you will be able to receive mail from that sender again. This is the way we’d prefer to have the problem solved, but there is another way. You can opt to have your Bway email account removed from the spam filtration list, and then you’ll be able to receive mail again from anyone and everyone. Should you choose this method, however, it’s likely that you’ll start getting more unsolicited commercial email. To have your account removed from the spam filtration system, please contact us at tech@bway.net. Bway.net cooperates with a number of different organizations that keep lists of outgoing mail servers with open relays and security issues. Bway.net filters mail coming from servers on these lists, with messages from such servers being returned to the sender. We regret that this filtering sometimes interrupts the flow of communication from legitimate senders to our customers, but since the sender is always notified that the message did not go through, no messages are irretrievably “lost in space.” And please note as well that this filtering can cut by up to 80% the amount of spam delivered to Bway’s customers. 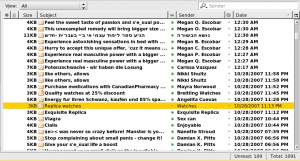 This spam is not merely an annoyance to each recipient who has to delete it from his or her inbox; the immense quantities of unsolicited and unwanted mail that flood our mail servers on an hourly basis can actually slow down our entire mail system. If someone with whom you correspond reports that messages sent to you are returned to them as undeliverable, it is likely that their ISP or organization maintains a mail server with an open relay or security problems. Often the providers or organizations are not aware of the problem (we know, because we landed on the list once ourselves and really appreciated the notice of the overlooked open relay). Being on the list does not necessarily imply that the ISP or organization is involved in sending unsolicited email, but their mail server is vulnerable to being used by spammers until the problem is addressed. So, in order for you to be able to receive mail from this sender again, their server’s administrator has to fix their mail server. The best thing you can do in this case is to send mail to the person (you can still send to them, even though they can’t send to you) or call them and tell them to forward the returned email that they got to their mail server administrator. Once the mail server administrator has fixed the open relay, they will need to notify the organization that listed their server. …the administrator should send an email to sword@dorkslayers.com indicating that the relay has been fixed. …the administrator should go to this web address for instructions. If there is no such message present, please send the full headers from a bounced message to tech@bway.net and we can tell you whom the server administrator has to contact. Please tell us when any mail is sent to this account, though, because we don’t check it regularly. If the sender doesn’t know how to get their email program to display the full message headers, click here for instructions. In most cases, the sender of the message that bounced can reach his or her mail server administrator at the “postmaster” email address. For example, if the sender’s email address is johndoe@example, they should notify postmaster@example.com. The sender may also want to call their internet service provider’s tech support department and inform them that they are listed in a blackhole list. If you are still confused by what’s going on, please contact us. We are happy to talk to you about your problem, and try to explain what is going on and what you can do about it. For more information, please see the SpamAssassin FAQ.